One of the main things you need to come to terms with when embarking upon a community food/self-sufficiency/local food type journey, is that your ingredients need to dictate the recipe, not the other way 'round. In our culture, we're so used to being able to think about what we want for dinner, then go to a shop and buy everything we need, with no regard for season or local availability. For this reason, a lot of people don't even know what's grown when, in what part of the world. Seasonal home-grown salad deliciousness, picked 5 minutes before it hits the table. When you start getting interested in local food and self-sufficiency, one of the first things you learn about is eating seasonally. We've written before about the joys of seasonal eating. We love it. If you try it, I bet you'll love it too. Of course, it means that there are, at certain times of the year, things you just can't eat. At the moment, for example, I'm pretty much busting for some broccoli and cabbage. But broccoli and cabbage aren't quite ready round these parts just yet. I've got a few more weeks' wait, but I know when the wait is over, the broccoli and cabbage is going to taste oh so sweet, not least of all because I haven't eaten any for some months. Sometimes, because of seasonal availability, or weird in-between-season gluts or dearths, you'll have a whole bunch of something, or little tiny bits of lots of things, or strange amounts of something else, and you think - what the heck am I going to do with this!? The answer, I've found, to these kind of seasonal-eating conundrums is, invariably, soup and/or salad. An heirloom tomato salad's gorgeousness is enough incentive for me to grow my own tomatoes. It's really easy to make a delicious soup or stew from whatever ingredients you have to hand. All year. If you have an on-hand source of home-made stock in your freezer, even better. Yesterday, for example, Louisa dug up a massive bowl of jerusalem artichokes, which had voluntarily grown themselves in amongst our lemon balm. With 12-hour-cooked chicken broth in the freezer, the answer to our jerusalem artichoke situation was pretty bloody self-evident, and tomorrow we shall be dining on some super-deliciousness. Likewise for salads. I grew up eating salads consisting of iceberg lettuce, tomato and cucumber. Delicious! While I still have a massive soft spot for iceberg lettuce, I've since learned that it's nigh-on impossible to grow, so have learned to settle for much more eclectic salad ingredients, dictated, at all times, by what's in the garden or the gardens' of our friends and neighbours. 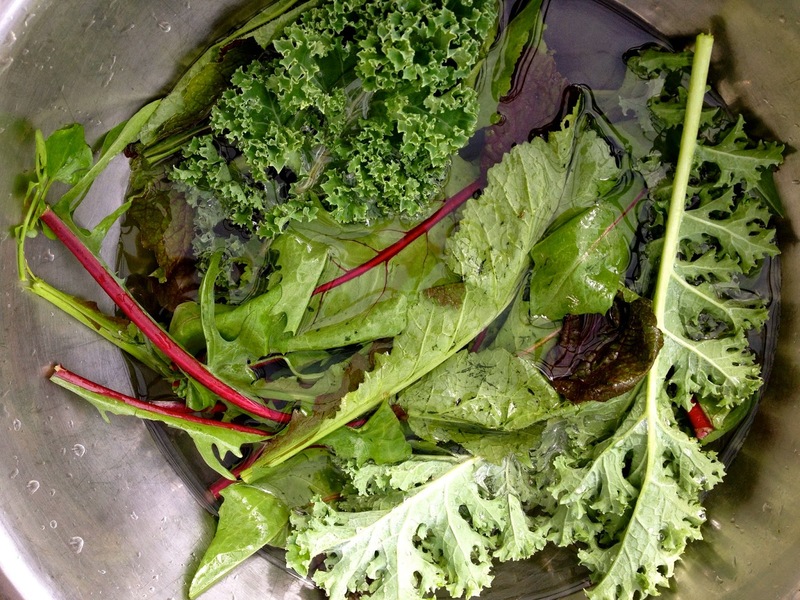 Kale (I find curly kale best for salad), red-veined dandelion leaves, rocket (grows like a weed! ), nasturtium (ditto! 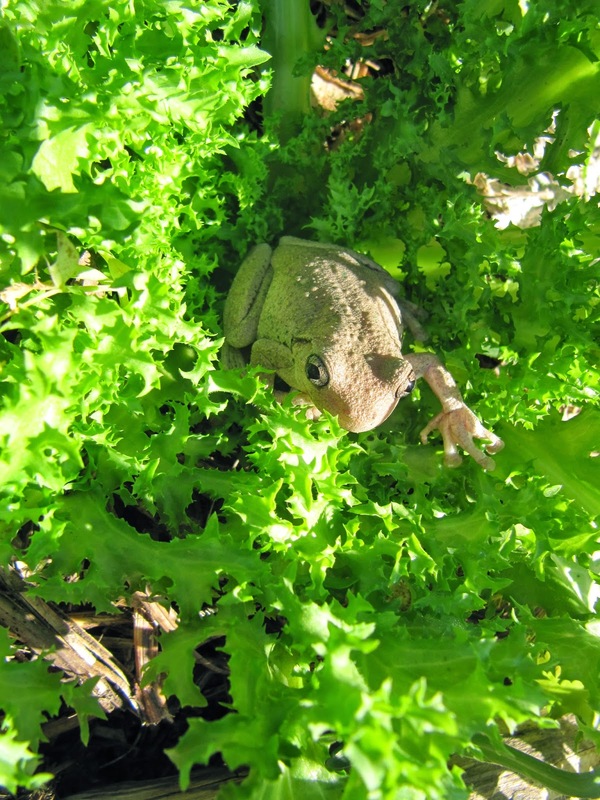 ), borage, herbs of all kinds and a plethora of self-seeded loose-leaf lettuce varieties all make regular appearances in salads at our place, year-round. Grated carrot, beetroot, garlic, and chopped tomatoes and celery, green beans, peas, cooked pumpkin and weeds like fat hen and nettle are also added, according to availability. I'm a massive fan of the grated and finely-chopped salad, because I like to have little bit of everything in every fork-ful. Makes it tasty, yo! grated carrot and beetroot, dandelion, kale, parsley, basil, chopped almonds, sunflower seeds and feta-stuffed bell peppers, grown and made by the lovely Bev. I love the colour! 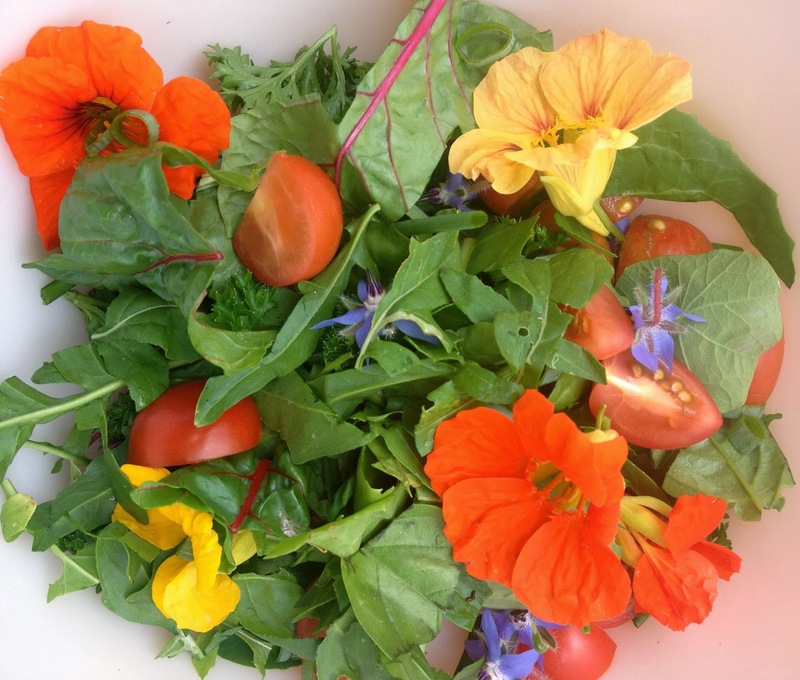 I also like to add nuts (chopped tamari almonds are a distinct fave), seeds, flowers (borage, nasturtium and calendula are my absolute favourites), olives or other preserved and pickled type things for extra tasty and extra nutrition. For dressing, I'm ever-faithful to a bit of lemon and olive oil, though I've recently been thoroughly enjoying ye olde tahini-based dressing, and sometimes a bit of a miso dressing. I'm extremely haphazard with my salad dressings, and will pretty much mix up anything that takes my fancy, with varying degrees of success. But that's the thing: When you're using good ingredients, it's pretty hard to make it taste like absolute crap. So even if your garden's patchy, or you've brought home a somewhat random selection of ingredients from your local market, rest assured that there's a delicious and nutritious salad or soup in store. Feel free to post your favourite salad dressing recipes or soup combos in the comments. We're always up for suggestions!! Extra added bonus of growing your own - you make friends. Anyone know what kind of frog this is? It's been a month since we started our Community Food Challenge in earnest. I'd say we're going pretty well! During the last month, in addition to challenging ourselves in the food ethics department, we've also had some adventures in mushroom foraging, a mastectomy and some time in hospital, many many helpful visitors (bringing delicious, nutritious, local treats like oysters and foraged mushrooms), we've processed a batch of Autumn Farm chickens, and Pearl, with the help of our visitors and local helpers, has done an amazing job of maintaining the farm as I recuperate from my surgery. So yeah, it's been a busy, emotionally crazy kind of time. In the food stakes, we've revelled in the joys of our community food endeavours, but we've also broken our own rules a few times. The culprits? Nori (the kids love it and it's REALLY good for them), raw organic cacao and coconut butter (it's delicious and has anti-oxidants in it... I know.... weeeeak...), and I believe Pearl at some point bought some discount corn thins for the kids while she was in the supermarket getting toilet paper. 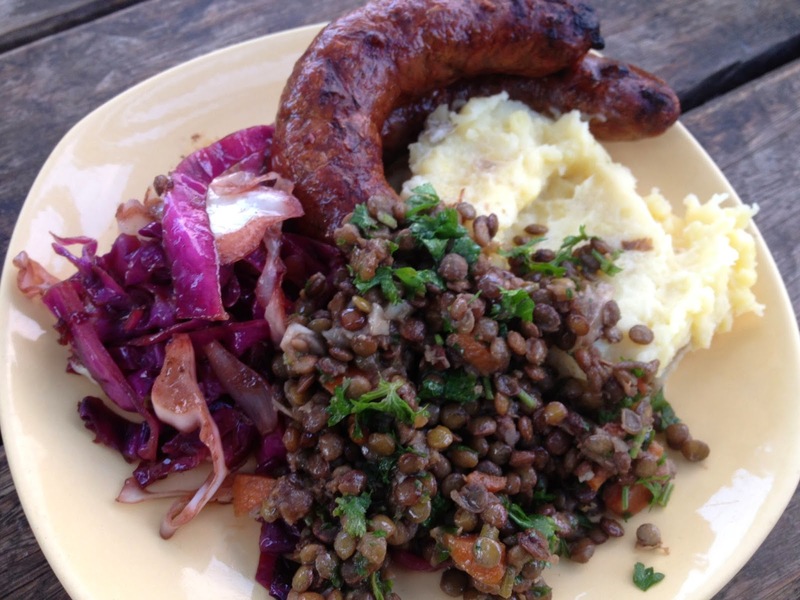 Home-made pork and fennel sausages with locally grown red cabbage and mashed potatoes, with lentils and herbs. 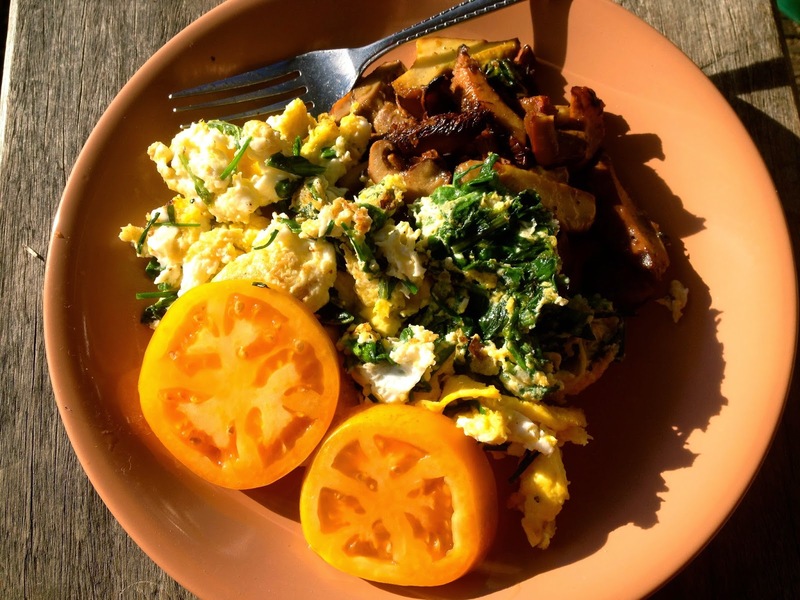 Home-grown eggs scrambled with home-grown leafies and herbs, sliced, just-picked tomato and foraged mushies courtesy of our mate Liz. Eggs poached in home-grown tomato stew with herbs and local jersey feta. The kids, Gab and I also had a rather successful mushrooming haul a couple of days before I went into hospital (much more successful, but no less fun, than our mushrooming ventures of last Autumn). It was a drizzly saturday when we all set off for the pines, to see if we could nab ourselves some pine mushrooms. We only found 2 of the pine mushrooms (Gab had them with poached eggs on toast), but we did find 2 baking trays full of slippery jacks! I've never had slippery jacks before, and some of the accounts I read online weren't too enticing. One writer even went so far as to write that given the amount of time it takes to prepare them for eating (you have to peel off the top slime, and some people recommend peeling of the pores from the underside - I did both), and their kind of bland, slimy texture, they're not really worth the effort. Here, I have to disagree. I reckon they maybe just weren't cooking them to their best effect. A little more research revealed that this kind of mushroom isn't the kind you just fry up and eat by the truckload like some other kinds. It's most commonly revered by Eastern Europeans, who like to cook them up into a stew. So Pearl fried ours up with some home-cured bacon, home-grown eschallots and garlic, and then used that as a base for a pearl barley, beef bone broth and rosemary stew. Nothing short of amazing and definitely, beyond a shadow of a doubt worth the peeling. Not to mention the fun we had picking them, in a beautiful setting, with beautiful people, which was worth all the work just by itself! The bone broth we used in the stew was something that had been cooked up to assist with my healing after surgery. A few days before I went into hospital for my mastectomy, we started cooking up a bone-broth of certified organic pasture-raised beef bones, courtesy of our friends the Thompsons at Symphony Farm. We cooked it over the fire for about 12 hours, then again on the stove for maybe another 12, to draw out all the super-goodness. While I was in hospital, Pearl continued the brew, adding veggies and garlic and tons and tons of kale. It. Was. Delicious. And nutritious. Luckily for me I was allowed to come home the day after my surgery, so I was able to enjoy this as my convalescing food for the days after my surgery, as opposed to the nutritionally devoid and most certainly not local (processed, packaged and frozen in Goulburn, in fact) hospital food. Perfect. And I'm pretty sure that the setting for the cooking of the bone broth also contributed to its awesomeness. I was also really glad to be home, healing in my own place, with my loved ones nearby. Have you had any fun, satisfying, delicious community food adventures lately? Luckily for us our chicken enterprise is rewarding and valuable for other reasons. 1. We're doing something we believe in, ethically, socially and economically: We treat our chickens and our land with respect, we feed our community good quality food at an affordable price, and we run our business in a way that is sustainable for us, for our community and the Earth. 2. We're contributing to the development of a local food system that is resilient. 4. We're involving our kids in a business that is ethical and sustainable, teaching them that it's good to work (hard) for what you believe in, and that earning heaps of money isn't everything. 5. Our chickens are delicious! With all that said, though, it's not like we don't care about making a profit. Doing all the hard work (sometimes it's really really hard!!!) 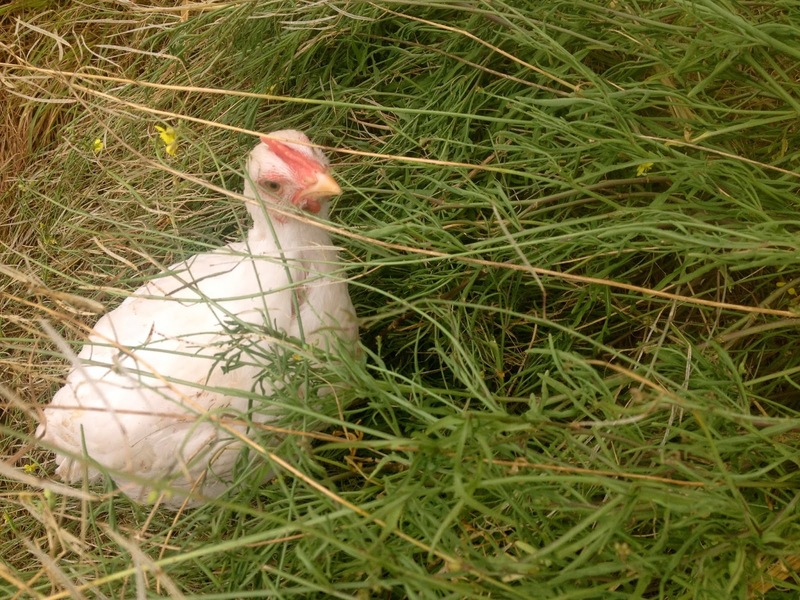 of pasture raising chickens and then selling them for no profit is just beyond our altruism levels. For this reason, we're working on ways to cut down on our input costs, by trying to grow as much food as we can for our chickens on farm. This, happily, also has positive environmental impacts for our business: the more food we grow, the less transportation (read: fossil fuels) is required to get the chookie's food into their beaks. Obviously the biggest factor here is that we pasture raise our chickens, so they eat a crap-load of grass, seeds, bugs and snails that are just right there for the taking, meaning that unlike shed chickens, we don't import 100% of their food from someone else's farm. We don't do anything to cultivate our pasture, other than the odd slashing. It's naturally really diverse, with a mixture of annuals and perennials, summer and winter dominant crops, so there's not really a down-time. But the chickens do still need grain. Our grand plan was to pasture crop an acre of triticale this Autumn, but ye olde cancer diagnosis and recent mastectomy threw a spanner in those works, and we're going to have to wait til next year. Call us piss-weak, but experimental grain growing was just a little beyond our capacity at this time. These chickens are eating microlaena seeds, and are about to stumble upon some sunflower seeds. Chickens, in the mean time, are being satisfied with other grown-on-farm delicacies like gone-to-seed rocket, lettuce, spinach et al, and some sunflowers we kind of accidentally grew over the summer by way of spilt seeds that were left all over the paddocks by the chickens. Bonus! Next summer we might actually do it on purpose! 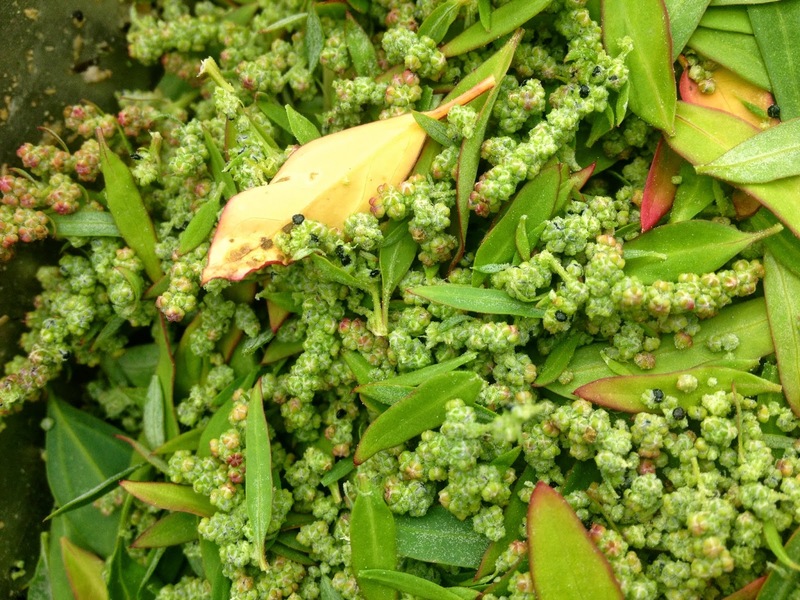 "Chenopodium album, Fat Hen, is probably named because chickens get fat from eating it. It has been used as a vegetable in Europe since prehistoric times. It grows faster and absorbs nutrients more efficiently than any crop, and can grow in almost anything. That plus the fact that it is also a rich source of nutrients makes it one of the most useful plants that there is." It's proved to be an absolute boon for our chickens. They love it, and we take them bunches and bunches of it every day all through the growing season. Now that it's going to seed, we're harvesting the seeds and adding them to the chickens' daily health porridge, which consists of wheat bran, ground sunflower and linseeds, apple cider vinegar, and kelp meal, and now, fat hen seeds. 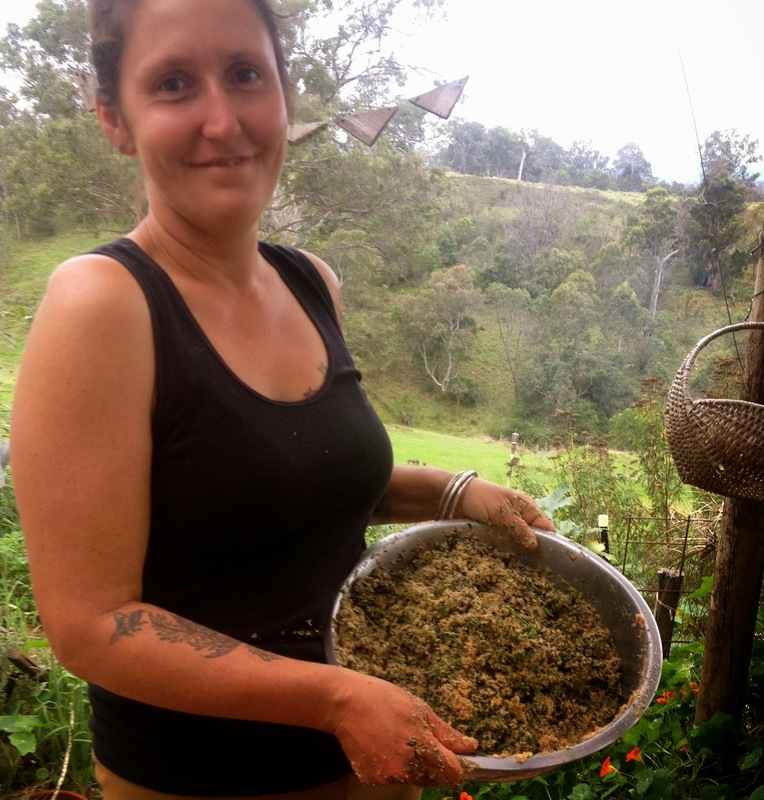 This lady-farmer has just mixed up a batch of super-health-chicken porridge, which she is about to deliver to her chickens. Recently, we've had the immense pleasure of seeing our home, garden, animals and lives through the lens of other people's cameras and words. I always find this kind of thing interesting, because we spend so much time just living our lives, that we often don't pause to think about how everything looks and seems to other people. Our first peek came in the form of a feature in the current issue of Peppermint Magazine (fittingly, the Autumn issue...), with photos taken by the lovely and quite photographically gifted Rohan Anderson, when he came to stay with us a few months back. Things looked great! Things looked stylish! It was kind of amusing and slightly unexpected actually given that to us, our place just mostly looks messy and/or overgrown and/or kind of unfinished and/or needing attention of one variety or another. Thank you Rohan for making our place look so pretty! 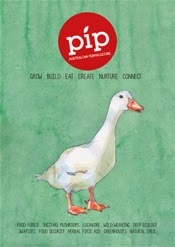 Next up was a feature in the incredibly wonderful, brand-spankin'-new Australian permaculture magazine, Pip. If you haven't got one yet, you should get one! It's very very beautiful, and it's also the first edition, so is bound to become a hella-cool collector's item. The words and photos are lovely and funny and generous and we felt so very proud to be in such an important and quite frankly such a spunky magazine with such a perfect duck on the cover! And then as if that all wasn't enough, we got a beautiful little package in the mail from Ally and Richard at Happy Earth, containing (amongst other joyful treasures) a thumb drive of photos they'd taken on their recent visit to our little farm. Of course, there were photos of food. Here, zucchini fritters, a chopped salad and some home-made flatbreads. Very very common summertime fare at our place. If you've seen their blog, you'll know that they take beautiful photos, so it was kinda nice to see our place through Ally's attentive eye. She photographed some of the things we take for granted, and, reflected back to us, they made us feel even more grateful for all the beauty around us - especially the stuff we don't even see any more because it's such a daily part of our lives. This photo, to me, looks like something out of a poultry version of Grease, with all the gang assembling for some kind of musical number sung by the protagonists, who are, of course, a Rhode Island Red and a Light Sussex. That makes sense, right?? At Uni this semester I've been teaching a course on Romantic literature. Think Blake, Keats, Wordsworth and Shelley. I'm loving it - especially Blake! One of the (many) cool things about the Romantics is their fascination and yearning for what they refer to as The Sublime. Basically, for the Romantics, the sublime is like the pinnacle of human experience - emotional, sensual, intellectual, spiritual. It's often to be found in nature, and it's sometimes so overwhelming it's actually kinda scary - but that's OK. It's what we should strive to be open to, and it's what they hoped to convey in their poetry, though almost by definition, The Sublime is actually beyond the measure and description of mere language. Cool eh? Now while I'm pretty sure that no Romantics ever thought of food being sublime, the other night when I was eating my dinner, I actually felt a sense of joy and contentment that was beyond words and hence, for me, sublime. Disproportionate serving of green veg for the cancer patient. Fish at top left. Our beautiful and outrageously lovely pal Brett caught some Frigate Mackerel at Bermi. Knowing that I'm in the market for as much healthy food as I can lay my kisser on, he called and invited himself for dinner, bringing along his 3 beautiful fish. He taught Oscar and I how to clean and fillet them, and they were ready for a light fry in the pan! As he wheeled the kids round and round in the wheelbarrow, amid some pretty out of control gleeful squealing, Pearl and I prepared the following to accompany the delicious fish: Some local Dutch Cream potatoes, steamed and dressed with local olive oil and herbs from our garden; a 'caponata' (kind of) involving tomatoes, beans and capsicums from Thea, zucchini out of our garden, and olives from Towamba Station; and a massive fricassee of homegrown garlic, kale and silverbeet, picked not 2 minutes before it hit the pan. 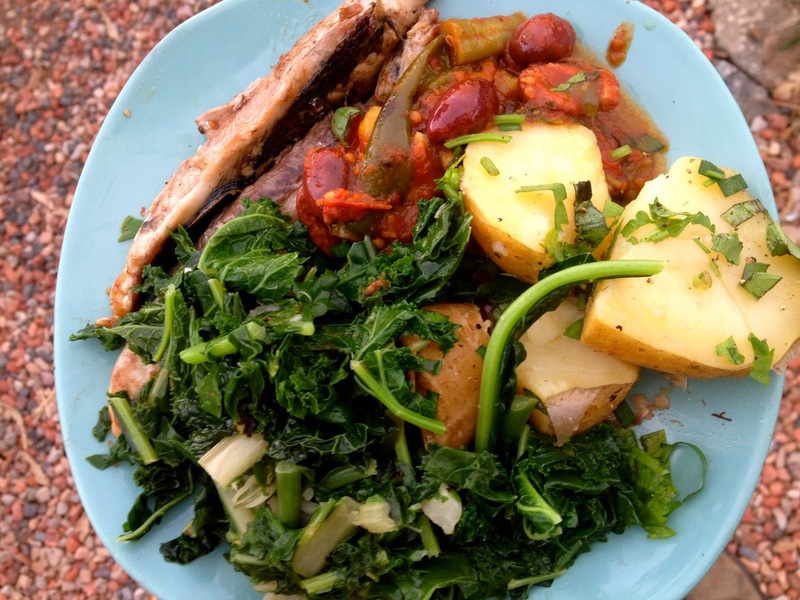 100% community food meals rock my world!!! As we sat and devoured the deliciousness in the fading light, I felt positively overwhelmed by the love and nutrition and good health and nature and strength and honesty of the meal and the company and the setting. Is it crazy that food should be so profound??? Maybe, but I don't really care, because it makes us happy and it feeds our bodies and souls, and that, in my book, counts for a heck of a lot more than whether something makes 'sense'. I believe the Romantics would concur.